Saturday afternoon saw a break in the rain, and I was able to get out into the garden. 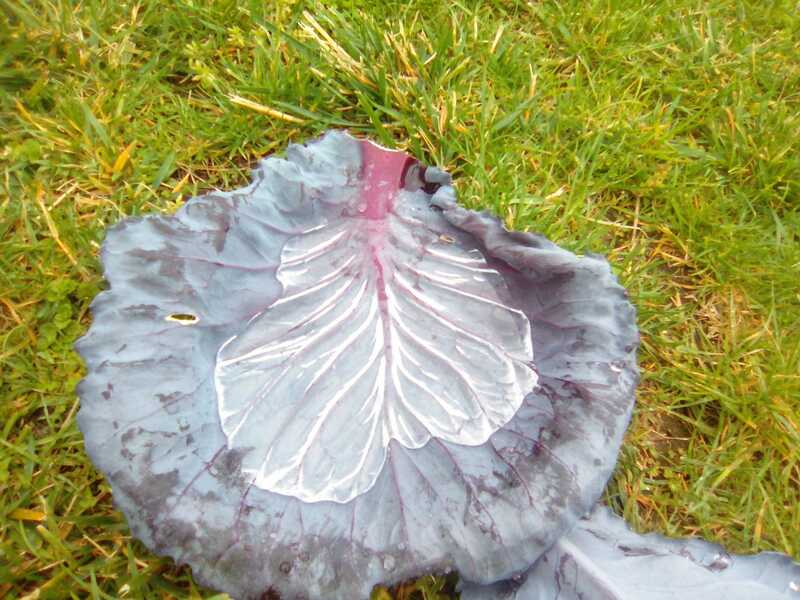 The first thing I did was to harvest a red cabbage for dinner. The nice bit of the cabbage is the tightly rolled leaves in the middle, but surrounding that are a whole lot of larger leaves, which I removed and left for the chickens. After another long period of rain, I returned and found the leaves on the lawn filled with water. That wasn’t surprising. However, the water ‘sat’ in the leaves in a rather unusual way. The leaves are very hydrophobic – meaning water doesn’t stick to them. There were no droplets of water on the leaf – they had all run down into a ‘pond’ at the leaf bottom, leaving the edge of the leaf completely dry. The water pond also took on a rather silvery appearance. When a liquid is added onto a surface (in air), it turns out that the water contacts the surface at a very specific angle to the surface depending on the contact energies for the liquid-surface, liquid-air and surface-air boundaries. 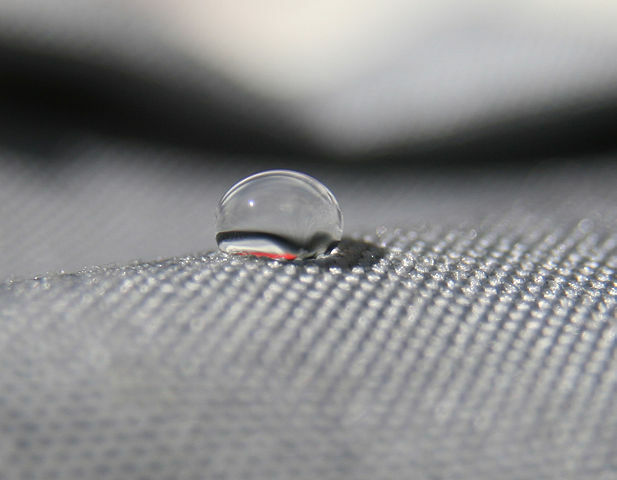 If the liquid-surface interfacial energy is high, as it is for water-on-cabbage, a droplet forms a very high contact angle – bigger than 90 degrees – as you can see in the following picture for a droplet on a cloth treated with a hydrophobic coating. This means that the droplet forms the greater part of a sphere when it sits on the surface, and that creates some interesting optical effects. Many plants have hydrophobic leaves. In the cabbage’s case, it is easy to see why this might suit the cabbage when it comes to watching what happens when it rains (or, under the hosepipe). The rain hits the outermost leaves, and, instead of sticking there, instantly runs down the leaf toward the centre of the plant. From there on, it finds its way into the base of the plant, and waters the soil around the cabbage. In other words, it very effectively captures any rain that falls on it. On the other hand, if the rain didn’t run down the leaves so easily (the leaves were hydrophilic) it would hang-around long enough to evaporate again when the sun came back out. Hydrophobic surfaces have great application – for example in waterproof clothing (the rain just runs off). In extreme cases, a surface can be superhydrophobic, and water just does not stick at all. Put that on your car windscreen and you have something that won’t ice-up (the dew just runs straight off as it forms). Put it on the side of a boat and the drag coefficient plummets.